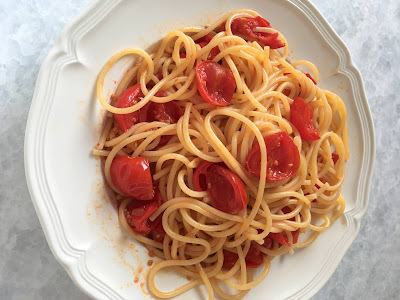 It is a dish that uses only a few ingredients: garlic, olive oil, hot pepper and the tastiest tomatoes you can find. You serve it with spaghetti and a little grated Parmigiano-Reggiano cheese on top. 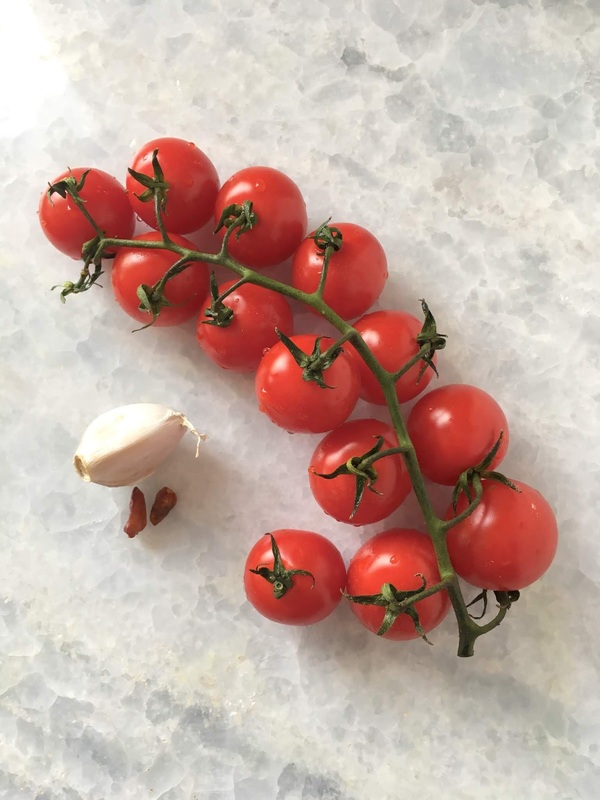 Pour some tasty olive oil in a skillet, add the peeled and crushed garlic clove and crush the dried Italian hot peppers (please keep the amount of heat to a minimum, it is supposed to add a small zing to your dish, this is about the tomatoes, not a spicy dish) and cook over low heat for 5 minutes. Set the water to boil in a covered saucepan. Wash the cherry tomatoes and cut them in half. Add them to the skillet with the garlic and and olive oil. Sautè over medium heat. When the water boils, add salt and add the pasta. Look at box and check the time. One minute before its supposedly done, pull one piece of pasta out and taste for doneness. When pasta is cooked, drain and toss the pasta in the sauce immediately. Prepare the dishes and serve immediately. Have the Parmigiano-Reggiano cheese on hand. It is really that simple and delicious. If you have time, you can cook the cherry tomatoes whole over medium heat and let them slowly pop while cooking. The only thing is to be careful as any unpopped tomatoes are really hot and you could burn your palate while popping one of those tomatoes in your mouth. I should know!